There I was, sitting in the theatre and before I could say “Wait, I don’t like these kinds of movies,” everything went dark and the film began. And the rest is history (or pseudo-history anyway). Related to, but not a remake of the original Planet of the Apes movies, this one begins at the beginning, so to speak, complete with better special effects. And action. And many expressions of surprised amazement. 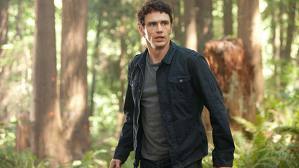 Will Rodman (James Franco, 127 Hours, Spiderman) is a scientist working for a pharmaceutical firm who develops a serum that may cure Alzheimer’s disease. The scientists are in the process of injecting this serum into a chimp when Will notices that the chimp is gaining IQ points geometrically. But before they can proceed with this success, suddenly everything goes awry when the main chimp goes crazy and destroys most of the lab. Never mind that the chimps are “caged” not in cages, not in Plexiglas, but actual glass, conveniently breakable. Things happen, the chimps are destroyed, and the project trashed, but Will takes in Caesar, the chimp’s baby, who has genetically inherited his mother’s intelligence. He and his girlfriend Caroline (Freida Pinto), a beautiful primatologist who does and says nothing that might reveal her expertise, take care of Caesar at home where they also care for Will’s father (John Lithgow) who is suffering from… you guessed it – Alzheimer’s. Will Will give in to the temptation to inject his own flesh and blood with the serum? I’m not telling and you can’t make me. Nor will I tell you how the apes turn mean, although I understand that all apes tend to turn against humans when they become adults – or at least become dangerous. The movie has us rooting for the animals and against the mercurial heartless drug company. It’s interesting that Americans seem to love movies that celebrate animals and other underdogs and condemn corporate greed and insensitivity, when in real life their inclinations are entirely the other way around. Anyway, the special effects are incredible, with shots of real orangutans and baboons and chimps interspersed with well, men in monkey suits. Of course there are no genitalia or bare bums to offend our sensitive natures. Andy Serkis is cited by some as “playing” Caesar, while others say he gave a “motion-capture” performance via digital technology. One can no longer simply refer to “animation,” a la Roger Rabbit. Caesar was certainly excellent, although I’m not sure exactly what he was, although some of the time I guess he was Andy Serkis, who did “Gollum” in Lord of the Rings and will soon to be featured again in The Hobbit. At some point (not saying why) Will is legally required to leave Caesar temporarily in a “shelter,” peopled by mean zoo keepers. It was fun to see Tom Felton almost reprise his role as the young Draco Malfoy in Harry Potter, this time cast as an abusive zoo keeper. Abuse? Fun? This does sound sick, but recall that both Harry and Planet are not meant to be taken too seriously. 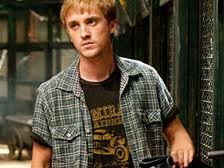 I just loved to hate Felton in this role. His terrific sneer will likely land him many wonderful villain roles. 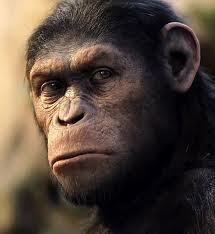 The apes are finally fed up and Caesar, smarter than all the rest, becomes their emancipator and ring leader. The humans, including Will and Caroline, get what they deserve. The couple somehow believes that they can just find Caesar and take up where they left off, having abandoned Caesar. But unlike a loyal dog, the ape has other plans. He has an obligation to his people (group? species? ), not to mention climbing the redwood trees of California. 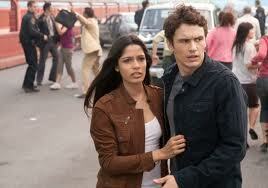 Franco and Pinto are like all of the other humans you’ve ever seen in these roles in movies like this. Loving, but not overly so, still seeing the animals as ignorant children but without so many feelings, and astonished in a rather childlike way when animals rebel. This is a big come-down for Franco after his remarkable performance in 127 Hours. Building on this fame, he’s likely always to be eligible for parts like this until he ages. Lithgow, another excellent actor, is just ok as a guy with Alzheimer’s – nothing special. Which probably the way director Rupert Wyatt (The Escapist) wanted it. The apes take center stage. And Caesar does win our hearts over with his soulful eyes. Spoiler in this paragraph: David Oyelowo as Steve Jacobs, the evil corporate boss, is quite good in his contempt for the animals and indeed any goal beyond the bottom line. He thwarts Will at every turn except when short-term financial gain may be involved. But there’s a problem here. At first glance it may seem like a good thing that a Black man, Ovelowo, is cast as the corporate boss, “the suit” as it were. 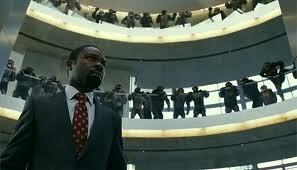 Oyelowo plays the part well. But film analysis requires paying attention to who gets “punished” and who doesn’t in films. Usually the villain dies but very often the villain is either an ugly man, a man of color or a woman of any color. Jacobs attempts to escape but to no avail and his demise is rather drawn out as he pleads for his life. I wanted him to be saved but I’m not sure how others felt. Would a white CEO be scripted to die or did this fate conveniently go to a man of color? Just asking. There was something odd about it. And racist. Just saying. There are quirky and delicious hints that point in the direction of the sequel, having to do with the serum’s dire affect on humans. Watch for the sneeze during the credits. It portends no good, and is really fun. Dum de dum dum (a reference that only the older of us will understand). I intend to see the sequel when it comes out even though there’s always about five to ten minutes in the middle of these things that I think I will die of boredom. But I didn’t die and I could have done worse with my time.